The Jawbone Mini Jambox is a sleek, portable speaker from one of the most influential companies in the world. 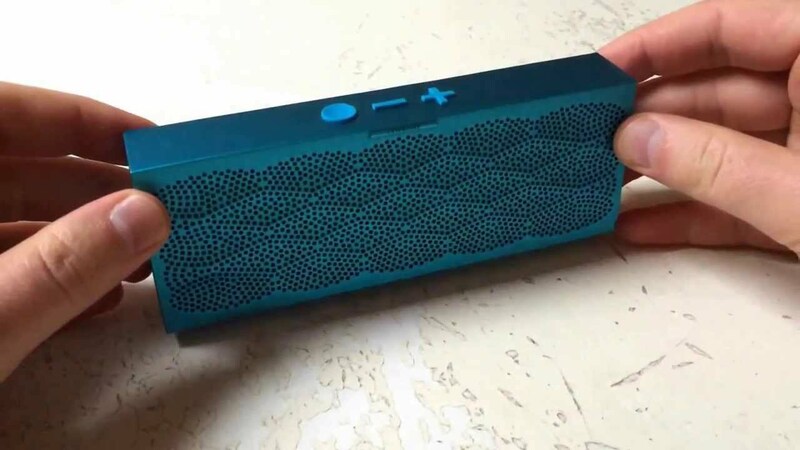 Jambox single-handedly started the portable speaker trend, and Jawbone’s little device is to blame for flooding marketplaces everywhere with pocket-sized speakers. Jambox has become an icon in the industry, but is Jawbone still top-dog? Or the fight between Jambox vs Bose crowns the latter? The Jawbone Mini Jambox is the company’s latest high-quality device which resembles a slimmer, more portable, and lighter original Jambox. It’s good looking, and stylish, it’s hip, and fresh, full of life, and vibrant. The Mini Jambox is the company’s first product to feature an all aluminium built enclosure, and it’s available in a wide variety of patterns and colors. World renowned designer Yves Behar provided his services for Jambox Mini. Jawbone praised themselves for developing an outstanding product. Let’s see if they are right. Check our review to find out more! You’ll fall in love with this lovely brick even before removing it from the box. The packaging is just fantastic. Inside the Mini Jambox, well, box, you’ll find a standard 24-inch long USB to micro-USB cable, and a 36-inch long audio cable – both of them have matching colors to better fit your device. Unlike the original Jambox, the Mini doesn’t include a USB wall charger, nor a carrying case. It’s a bit disappointing, but not something worth fussing over. Most likely because it isn’t an accessory hog like the original Jawbone Jambox, the Mini is about $20 cheaper, and it retails at $180 – you can even find it at $150 in some places like Amazon, and Best Buy. 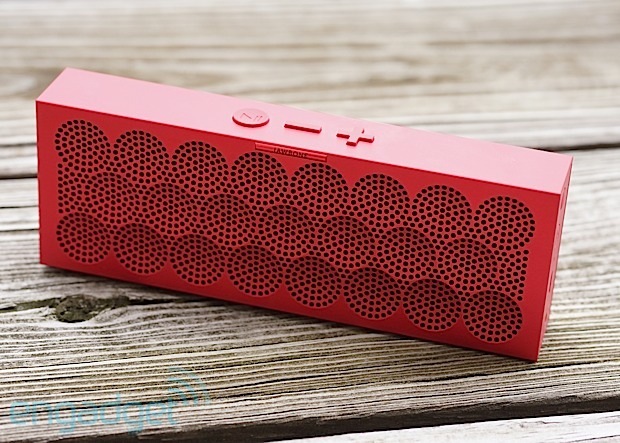 The Jawbone Jambox Mini leaves the original design behind, and the new portable speaker removes the rubber sandwich. In its stead, it chooses a full, single body aluminium construct. It’s built to last, and you won’t see no finishing lines present. I don’t think I’ve ever seen a more precise-built speaker. We reviewed the Bose SoundLink Color, which we just loved, and I have to say that it falls a little bit short when compared with the Jawbone speaker. It’s arguably prettier than anything Jawbone has ever done, and even though it rocks a little bit of the same styling we have been accustomed to, it’s a different beast entirely. 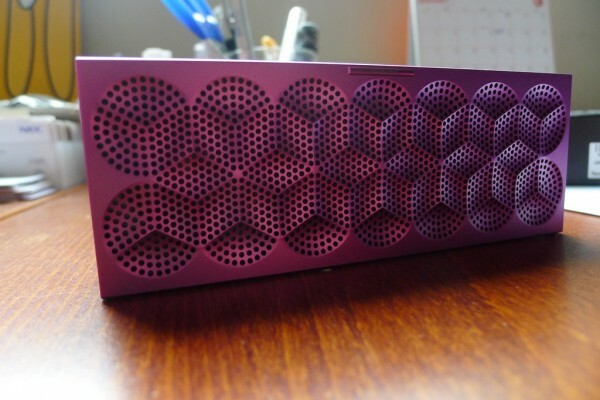 The striking pattern on the top of the Mini Jambox was designed by none other than the renowned Yves Behar. The portable speaker stands tall as one of the sexiest devices on Earth. I might even go as far as naming it a modern piece of art. It comes in 9 different color patterns that just yell retro-chic – from orange anodized colors, to bold yellow dotted patterns. It can sway anyone into buying it, regardless of individual taste. It’s shockingly slender, and you can even say that Jawbone put the chubby original Jambox on a strict diet. It has that brick-feeling when carried, and it feels more natural while holding it. It’s pocket-sized, and when I say that it fits in your pocket I mean you won’t be showcasing a huge grotesque bulge. It stays true to its Mini moniker. It’s 6-inches long, as the original Jambox, but it’s lighter, and approximately as twice as thin as its older sibling. Measuring 0.96 inches thin, it’s one of the slimmest wireless portable speakers available on the market. On its back you’ll notice the mirrored design embossed in the superb solid aluminum facade – but without holes in it. As Bose’s SoundLink Mini, the Jawbone Bluetooth speaker is made out of high-quality materials. The unibody aluminium construct is perfectly made, and there’s no chipping on the sides, or near the grill on the front. Design-wise, you can’t find anything worth condemning. The sand-blasted aluminum finish gives a sweet fulfilling vibe, and it’s more than pleasant to the touch. In short, it’s one hell of an eye-candy portable speaker, and for about $150-$180 bucks, it’s a steal! It doesn’t rattle, and nor does it creak when heavy bass tracks are played at max volume. It’s worth noting that at the bottom, you’ll find two rubber feet which are designed for traction, and reducing vibration. Buttons galore, said no one on the design team. At the top of your Mini Jambox you’ll find located tactile up, and down volume buttons, and a multi-function one which can be used for playing and pausing, skipping audio tracks, answering and ending calls, and of course, you can even wake up Siri. It comes with a built-in omnidirectional microphone that has an impressive 360-degree span. It features echo-cancellation so the wireless speakerphone can be incredibly loud without using its crystal clear capability. When receiving calls, your speaker will read out loud the phone number while the ringtone can be heard in the foley layer. Regardless if your iPhone is set on silent or not. Everything sounds crystal clear – no signs of noise present. There are no frustrating, or annoying Bluetooth pairing failures. This is mainly because of the Bluetooth 4.0, and partly because the Mini Jambox’s top-notch software. Bluetooth pairing is easy, intuitive – simply brilliant. It can connect to any Bluetooth device without an issue in sight. When you first power-up your Mini Jambox, you’ll be required to turn your B-tooth on your smartphone of choice, or tablet, and choose Big Jambox on the pairing list. That’s it. A near instant-connection, and you’re set to rock your apartment. After you’ve successfully paired your Jawbone Mini Jambox, you’ll have the possibility of choosing from a wide arrange of human voices that will notify you using the MyTalk voice system feature. It’s default setting uses a human female voice, but you can change it to a male if you prefer. It even let’s you pick a funny voice, or accent. When you get an incoming call, or you’re checking on the battery’s life, the Mini Jambox will notify you with the unique voice you’ve chosen. It’s a little gimmick, but we appreciate it’s addition. It makes the Jambox Mini unique, and awesome. Sadly, you can’t pair two Jambox Mini devices in stereo mode. While not a deal-breaker, it’s still something worth noting. The Mini Jambox is equipped with a rechargeable battery which is capable of lasting up to 10 hours of continuous music streaming. A fact regarded more than impressive considering its size, and price. Please note that battery life can vary depending on the volume level you set the device to. Sound quality is exceptional, but it hasn’t improved that much. It has two-front facing audio drivers, which you can find in the original Jambox. The Single bass radiator sits tightly between them in order to output a dynamic sound – Jawbone’s signature move I might add. Jawbone goes digital to optimize the sound the device spurs. This produces a more accurate sound that doesn’t feature that much bass. The original Jambox drowned, just slightly, the sound in bass. The Mini doesn’t, and we can classify this as a tiny, but welcomed, improvement. Bottom line, it sounds better than the original, although, depending on personal taste, some will see this as a deal breaker. Muddy bass tones are pretty great for particular songs. For $180, it’s a must-buy. For $150 it’s practically a steal. This lovable brick outputs clear, and precise sound encompassed by a beautiful design, and an excellent user experience.